Kdump is a kernel crash dumping mechanism that allows you to save the contents of the system’s memory for later analysis. It relies on kexec, which can be used to boot a Linux kernel from the context of another kernel, bypass BIOS, and preserve the contents of the first kernel’s memory that would otherwise be lost. In case of a system crash, kdump uses kexec to boot into a second kernel (a capture kernel). This second kernel resides in a reserved part of the system memory that is inaccessible to the first kernel. The second kernel then captures the contents of the crashed kernel’s memory (a crash dump) and saves it. A kernel crash dump can be the only information available in the event of a failure, the importance of having this data in a business critical environment cannot be underestimated. Red Hat advise that System Administrators regularly update and test kexec-tools in your normal kernel update cycle. This is especially important when new kernel features are implemented. In order for kdump to be able to capture a kernel crash dump and save it for further analysis, a part of the system memory has to be permanently reserved for the capture kernel. When reserved, this part of the system memory is not available to main kernel. Another factor which influences the amount of memory to be reserved is the total amount of installed system memory. For example, on the x86_64 architecture, the amount of reserved memory is 160 MB + 2 bits for every 4 KB of RAM. On a system with 1 TB of total physical memory installed, this means 224 MB (160 MB + 64 MB). For a complete list of memory requirements for kdump based on the system architecture and the amount of physical memory, see Section 7.7.1, “Memory requirements for kdump”. On many systems, kdump can estimate the amount of required memory and reserve it automatically. This behavior is enabled by default, but only works on systems that have more than a certain amount of total available memory, which varies based on the system architecture. See Section 7.7.2, “Minimum threshold for automatic memory reservation” for a list of minimum requirements for automatic memory reservation based on the system architecture. If the system has less than the minimum amount of memory required for the automatic allocation to work or if your use case requires a different value, you can configure the amount of reserved memory manually. For information on how to do so on the command line, see Section 7.2.2.1, “Configuring the memory usage”. For information on how to configure the amount of reserved memory in the graphical user interface, see Section 7.2.3.1, “Configuring the memory usage”. It is highly recommended to test the configuration after setting up the kdump service, even when using the automatic memory reservation. For instructions on how to test your configuration, see Section 7.3, “Testing the kdump configuration”. 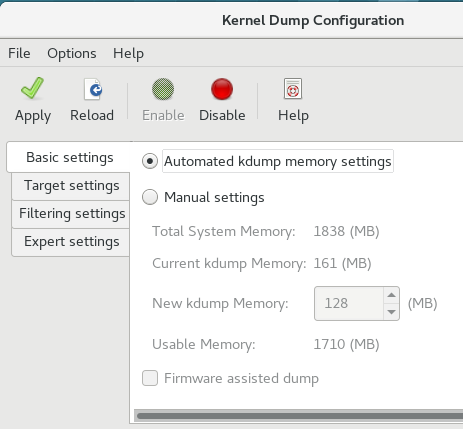 In many cases, the kdump service is installed and activated by default on new Red Hat Enterprise Linux 7 installations. The Anaconda installer provides a screen for kdump configuration when performing an interactive installation using the graphical or text interface. The installer screen is titled Kdump and is available from the main Installation Summary screen, and only allows limited configuration - you can only select whether kdump is enabled and how much memory is reserved. Information about memory requirements for kdump is available in Section 7.7.1, “Memory requirements for kdump”. The Kdump configuration screen in the installer is documented in the Red Hat Enterprise Linux 7 Installation Guide. In previous releases of Red Hat Enterprise Linux, kdump configuration was available in the Firstboot utility which was automatically executed after the installation finished and the system rebooted for the first time. Starting with Red Hat Enterprise Linux 7.1, kdump configuration has been moved into the installer. The command above secures installation of kdump and all other necessary packages, assuming your system has an active subscription or a custom repository containing the kexec-tools package for your system’s architecture. For more information on how to install new packages in Red Hat Enterprise Linux 7 using the Yum package manager, see the Red Hat Enterprise Linux 7 System Administrator’s Guide. Starting with Red Hat Enterprise Linux 7.4 the Intel IOMMU driver is supported with kdump. When running kernels from version 7.3 or earlier, it is advised that Intel IOMMU support is disabled. Memory reserved for the kdump kernel is always reserved during system boot, which means that the amount of memory is specified in the system’s boot loader configuration. For information about how to change the crashkernel= option on AMD64 and Intel 64 systems and IBM Power Systems servers using the GRUB2 boot loader, and on IBM Z using zipl, see Section 3.1.1, “Setting kernel command-line parameters”. The crashkernel= option can be defined in multiple ways. The auto value enables automatic configuration of reserved memory based on the total amount of memory in the system, following the guidelines described in Section 7.7.1, “Memory requirements for kdump”. Larger memory systems, up to the established limits of the operating system <link to OS Limits> are calculated according to architecture with the crashkernel=auto option. Replace the auto value with a specific amount of memory to change this behavior. 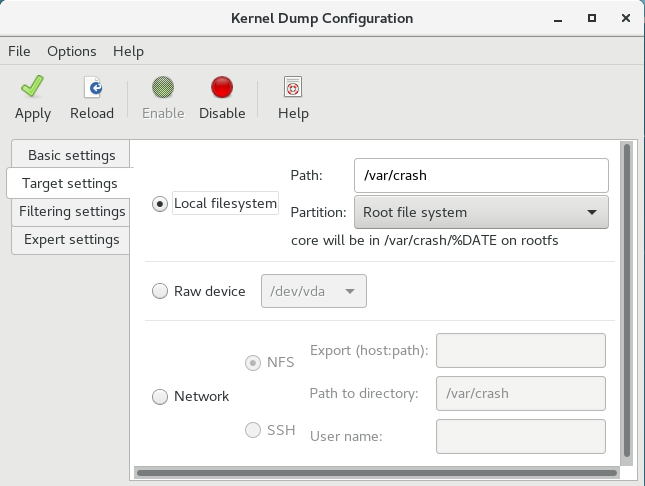 When a kernel crash is captured, the core dump can be either stored as a file in a local file system, written directly to a device, or sent over a network using the NFS (Network File System) or SSH (Secure Shell) protocol. Only one of these options can be set at the moment, and the default option is to store the vmcore file in the /var/crash/ directory of the local file system. To change this, as root, open the /etc/kdump.conf configuration file in a text editor and edit the options as described below. To change the local directory in which the core dump is to be saved, remove the hash sign ("#") from the beginning of the #path /var/crash line, and replace the value with a desired directory path. In Red Hat Enterprise Linux 7, the directory defined as the kdump target using the path directive must exist when the kdump systemd service is started - otherwise the service fails. This behavior is different from earlier releases of Red Hat Enterprise Linux, where the directory was being created automatically if it did not exist when starting the service. Specifying storage devices using a LABEL= or UUID= is recommended. Disk device names such as /dev/sda3 are not guaranteed to be consistent across reboot. See the Red Hat Enterprise Linux 7 Storage Administration Guide for information about persistent disk device naming. When dumping to DASD on s390x hardware, it is essential that the dump devices are correctly specified in /etc/dasd.conf before proceeding. For information on how to configure an SSH server and set up a key-based authentication, see the Red Hat Enterprise Linux 7 System Administrator’s Guide. For a complete list of currently supported and unsupported targets sorted by type, see Table 7.3, “Supported kdump Targets”. To reduce the size of the vmcore dump file, kdump allows you to specify an external application (a core collector) to compress the data, and optionally leave out all irrelevant information. Currently, the only fully supported core collector is makedumpfile. To enable the core collector, as root, open the /etc/kdump.conf configuration file in a text editor, remove the hash sign ("#") from the beginning of the #core_collector makedumpfile -l --message-level 1 -d 31 line, and edit the command line options as described below. By default, when kdump fails to create a core dump at the target location specified in Section 7.2.2.2, “Configuring the kdump type”, kdump reboots the system without saving the vmcore. To change this behavior, as root, open the /etc/kdump.conf configuration file in a text editor, remove the hash sign ("#") from the beginning of the #default shell line, and replace the value with a desired action as described in Table 7.5, “Supported Default Actions”. In Red Hat Enterprise Linux 7, the directory defined as the kdump target must exist when the kdump systemd service is started - otherwise the service fails. This behavior is different from earlier releases of Red Hat Enterprise Linux, where the directory was being created automatically if it did not exist when starting the service. For more information on systemd and configuring services in general, see the Red Hat Enterprise Linux 7 System Administrator’s Guide. 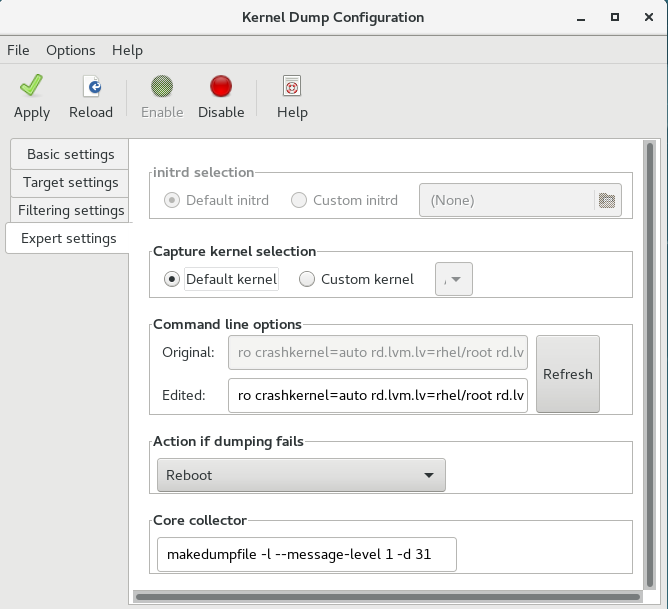 To start the Kernel Dump Configuration utility, select Activities → Other → Kernel crash dumps from the panel, or type system-config-kdump at a shell prompt. As a result a window appears as shown in Figure 7.1, “Basic Settings”. The utility allows you to configure kdump as well as to enable or disable starting the service at boot time. When you are done, click Apply to save the changes. Unless you are already authenticated, enter the superuser password. The utility presents you with a reminder that you must reboot the system in order to apply any changes you have made to the configuration. The Basic Settings tab enables you to configure the amount of memory that is reserved for the kdump kernel. To do so, select the Manual settings radio button, and click the up and down arrow buttons next to the New kdump Memory field to increase or decrease the amount of memory to be reserved. Notice that the Usable Memory field changes accordingly showing you the remaining memory that is available to the system. See Section 7.1.2, “Memory requirements” for more information on kdump’s memory requirements. The Target Settings tab allows you to specify the target location for the vmcore dump. The dump can be either stored as a file in a local file system, written directly to a device, or sent over a network using the NFS (Network File System) or SSH (Secure Shell) protocol. To save the dump to the local file system, select the Local filesystem radio button. Optionally, you can customize the settings by choosing a different partition from the Partition drop-down list and a target directory using the Path field. To write the dump directly to a device, select the Raw device radio button, and choose the desired target device from the drop-down list next to it. To send the dump to a remote machine over a network connection, select the Network radio button. To use the NFS protocol, select the NFS radio button, and fill the Server name and Path to directory fields. To use the SSH protocol, select the SSH radio button, and fill the Server name, Path to directory, and User name fields with the remote server address, target directory, and a valid user name respectively. For information on how to configure an SSH server and set up a key-based authentication, see the Red Hat Enterprise Linux 7 System Administrator’s Guide. For a complete list of currently supported targets, see Table 7.3, “Supported kdump Targets”. The Filtering Settings tab enables you to select the filtering level for the vmcore dump. To exclude the zero page, cache page, cache private, user data, or free page from the dump, select the checkbox next to the appropriate label. To customize the options that are passed to the makedumpfile core collector, edit the Core collector text field; see Section 7.2.2.3, “Configuring the core collector” for more information. To start the kdump service at boot time, click the Enable button on the toolbar and then click the Apply button. This enables and activates the service for multi-user.target. Click the Disable button and confirm by clicking the Apply button to disable the service immediately. For more information on systemd targets and configuring services in general, see the Red Hat Enterprise Linux 7 System Administrator’s Guide. The commands below cause the kernel to crash. Use caution when following these steps, and by no means use them on a production system. This forces the Linux kernel to crash, and the address-YYYY-MM-DD-HH:MM:SS/vmcore file is copied to the location you have selected in the configuration (that is, to /var/crash/ by default). In addition to confirming the validity of the configuration, this action can also be used to record how long it takes to a crash dump to complete if it is performed under a representative test load. zipl(8) — a manual page for the zipl boot loader utility for IBM Z. /usr/share/doc/kexec-tools-version/kexec-kdump-howto.txt — an overview of the kdump and kexec installation and usage. The Red Hat Knowledgebase article about the kexec and kdump configuration. The Red Hat Knowledgebase article about supported kdump targets. The kexec and kdump mechanisms are a reliable and proven method of capturing a core dump on AMD64 and Intel 64 systems. However, some hardware with a longer history, particularly mini and mainframe systems, allows us to leverage the onboard firmware to isolate regions of memory and prevent any accidental overwriting of data that is important to the crash analysis. This chapter covers some of the available firmware assisted dump methods and how they integrate with Red Hat Enterprise Linux. Firmware-assisted dump (fadump) is a reliable alternative to kexec-kdump available on IBM PowerPC LPARS. It captures vmcore from a fully-reset system with PCI and I/O devices reinitialized. While this mechanism uses the firmware to preserve the memory in case of a crash, it reuses the kdump userspace scripts to save the vmcore"
To achieve this, fadump registers the regions of memory that must be preserved in the event of a crash with the system firmware. These regions consist of all the system memory contents, except the boot memory, system registers and hardware Page Table Entries (PTEs). For further details about the fadump mechanism, including PowerPC-specific methods of resetting hardware, review /usr/share/doc/kexec-tools-X.y.z/fadump-howto.txt where "X.y.z" correspond to the version number of kexec-tools installed on your system. The area of memory not preserved and known as boot memory is the amount of RAM required to successfully boot the kernel after a crash event. By default, the boot memory size is 256MB or 5% of total system RAM, whichever is larger. Unlike a kexec-initiated event, the fadump process uses the production kernel to recover a crash dump. When booting after a crash, PowerPC hardware makes the device node /proc/device-tree/rtas/ibm,kernel-dump available to procfs, which the fadump-aware kdump scripts check for to save the vmcore. After this has completed, the system is rebooted cleanly. Install and configure kdump as described in Section 7.2, “Installing and configuring kdump”. GRUB_CMDLINE_LINUX="rd.lvm.lv=rhel/swap crashkernel=auto rd.lvm.lv=rhel/root rhgb quiet fadump=on"
GRUB_CMDLINE_LINUX="rd.lvm.lv=rhel/swap crashkernel=xxM rd.lvm.lv=rhel/root rhgb quiet fadump=on"
As with all boot configuration options, it is strongly recommended that you test the configuration before it is needed. If you observe Out of Memory (OOM) errors when booting from the crash kernel, increase the value specified in crashkernel= until the crash kernel can boot cleanly. Some trial and error may be required in this case. There are two firmware assisted dump mechanisms on IBM Z. They are Stand-alone Dump and VMDUMP. The kdump infrastructure is supported and utilized on these systems and configuration from Red Hat Enterprise Linux is described in Section 7.2, “Installing and configuring kdump”. However, there are potentially some advantages to using either of the firmware assisted methods IBM Z hardware provides. The Stand-alone Dump (SADMP) mechanism is initiated and controlled from the system console, and must be stored on an IPL bootable device. Similar to SADMP is VMDUMP. This tool is also initiated from the system console, but has a mechanism to retrieve the resulting dump from hardware and copy it to a system for analysis. Although VMDUMP contains a mechanism to receive the dump file into a Red Hat Enterprise Linux system, the configuration and control of both SADMP and VMDUMP are managed from the IBM Z Hardware console. The Fujitsu sadump mechanism is designed to provide a fallback dump capture in the event kdump is unable to complete successfully. The sadump process is invoked manually from the system ManageMent Board (MMB) interface. With this system, configure kdump as normal for an X86_64 server and then perform the following additional steps to enable sadump. Add or edit the following lines in /etc/sysctl.conf to ensure that kdump starts as expected for sadump. In addition to the above, you must also add some options to /etc/kdump.conf to ensure that kdump behaves correctly for sadump. In particular, ensure that after kdump, the system does not reboot. If the system reboots after kdump has failed to save core, then you have no opportunity to invoke sadump. Set the default action in /etc/kdump.conf to be either halt or shell to achieve this. For details on configuring your hardware for sadump, see the FUJITSU Server PRIMEQUEST 2000 Series Installation Manual. To determine the cause of the system crash, you can use the crash utility, which provides an interactive prompt very similar to the GNU Debugger (GDB). This utility allows you to interactively analyze a running Linux system as well as a core dump created by netdump, diskdump, xendump, or kdump. For more information on how to install new packages in Red Hat Enterprise Linux using the Yum package manager, see the Red Hat Enterprise Linux 7 System Administrator’s Guide. Use the same <kernel> version that was captured by kdump. To find out which kernel you are currently running, use the uname -r command. Copyright (C) 2002-2010  Red Hat, Inc.
To display the kernel message buffer, type the log command at the interactive prompt. To display the kernel stack trace, type the bt command at the interactive prompt. You can use bt <pid> to display the backtrace of a single process. Type help bt for more information on the command usage. To display status of processes in the system, type the ps command at the interactive prompt. You can use ps <pid> to display the status of a single process. Type help ps for more information on the command usage. To display basic virtual memory information, type the vm command at the interactive prompt. You can use vm <pid> to display information on a single process. Type help vm for more information on the command usage. To display information about open files, type the files command at the interactive prompt. You can use files <pid> to display files opened by only one selected process. Type help files for more information on the command usage. What considerations need to be made for using Kdump in a clustered environment? How do I configure kdump for use with the RHEL 6, 7 High Availability Add-On? shows the options available to system administrators using the High Availability Add-On. Kdump fails during early boot, How do I capture the boot log? If there is a problem booting the second kernel, it is necessary to review the early boot logs, these can be obtained by enabling a serial console to the affected machine. How do I setup serial console in RHEL7? shows the configuration needed to enable access to the early boot messages. How do I increase the messaging from makedumpfile for debugging? In the event that makedumpfile fails, then it is necessary to increase the log level to understand what is going wrong. This is different from setting the dump level and is achieved by editing /etc/kdump.conf and increasing the message_level option to makedumpfile on the core_collector line entry. By default makedumpfile is set to level 7, which includes the progress indicator, common message, and error message output. Set this level to 31 to get further debugging information. How do I debug Dracut? Sometimes dracut can fail to build an initramfs. If this happens, increase the log level in dracut to isolate the issue. Edit /etc/kdump.conf and change the dracut_args line to include the option -L 5 in addition to any other dracut arguments you require. What methods of dumping are available for virtual machines? In most cases, the kdump mechanism is sufficient for obtaining a memory dump from a machine after a crash or panic. This can be set up in the same manner as installations to bare metal. However, in some cases, it is necessary to work directly with the hypervisor to obtain a crash dump. There are two mechanisms available with libvirt to achieve this; pvpanic and virsh dump. Both of these methods are described in the Virtualization Deployment and Administration Guide. The pvpanic mechanism can be found at Virtualization Deployment and Administration Guide - Setting a Panic Device. The virsh dump command is discussed in Virtualization Deployment and Administration Guide - Creating a Dump File of a Domain’s Core. How do I upload a large dump file to Red Hat Support Services? In some cases, it might be necessary to send a kernel crash dump file to Red Hat Global Support Services for analysis. However, the dump file can be very large, even after being filtered. Since files larger than 250 MB cannot be uploaded directly through the Red Hat Customer Portal when opening a new support case, an FTP server is provided by Red Hat for uploading large files. The FTP server’s address is dropbox.redhat.com and the files are to be uploaded in the /incoming/ directory. Your FTP client needs to be set into passive mode; if your firewall does not allow this mode, use the origin-dropbox.redhat.com server using active mode. Make sure that the uploaded files are compressed using a program such as gzip and properly and descriptively named. Using your support case number in the file name is recommended. After successfully uploading all necessary files, provide the engineer in charge of your support case with the exact file name and its SHA1 or MD5 checksum. For more specific instructions and additional information, see How to provide files to Red Hat Support. How much time is needed for a crash dump to complete? It is often necessary, for the purposes of disaster recovery planning, to know how long a dump takes to complete. However, the length of time it takes is highly dependent on the amount of memory being copied to disk and the speed of the interfaces between RAM and storage. For any test of timings, the system must be operating under a representative load, otherwise the page exclusion choices can present a false view of kdump behavior with a fully loaded production system. This discrepancy is present especially when working with very large quantities of RAM. Also consider storage interfaces in your planning when assessing time to dump. Because of network constraints, a connection dumping over ssh for example, can take longer to complete than a locally attached SATA disk. How is Kdump configured during installation? You can configure kdump during installation with a limited set of options in kickstart or the interactive GUI. The kdump configuration using the anaconda installation GUI is documented in the KDUMP section of the Installation Guide. With this add-on to Kickstart, you can disable or enable kdump functionality, optionally defining the reserved memory size, either by explicitly invoking the default option of auto (which is also the case if the entire switch is omitted) or specifying a numeric value in megabytes. To learn how Kickstart can be used to automate system deployments, read Kickstart Installations in the Installation Guide. For further details about Kickstart add-on syntax, review the Kickstart Syntax Reference in the Installation Guide. In order for kdump to be able to capture a kernel crash dump and save it for further analysis, a part of the system memory has to be permanently reserved for the capture kernel. The table below contains a list of minimum memory requirements for kdump based on the system’s architecture and total available physical memory. For information on how to change memory settings on the command line, see Section 7.2.2.1, “Configuring the memory usage”. For instructions on how to set up the amount of reserved memory in the graphical user interface, see Section 7.2.3.1, “Configuring the memory usage”. 160 MB + 2 bits for every 4 KB of RAM. For a system with 1 TB of memory, 224 MB is the minimum (160 + 64 MB). For more information about various Red Hat Enterprise Linux technology capabilities and limits, see https://access.redhat.com/articles/rhel-limits. On some systems, it is possible to allocate memory for kdump automatically, either by using the crashkernel=auto parameter in the bootloader’s configuration file, or by enabling this option in the graphical configuration utility. For this automatic reservation to work, however, a certain amount of total memory needs to be available in the system. This amount differs based on the system’s architecture. The table below lists the thresholds for automatic memory allocation. If the system has less memory than specified in the table, memory needs to be reserved manually. For information on how to change these settings on the command line, see Section 7.2.2.1, “Configuring the memory usage”. For instructions on how to change the amount of reserved memory in the graphical user interface, see Section 7.2.3.1, “Configuring the memory usage”. When a kernel crash is captured, the core dump can be either written directly to a device, stored as a file on a local file system, or sent over a network. The table below contains a complete list of dump targets that are currently supported or explicitly unsupported by kdump. For information on how to configure the target type on the command line, see Section 7.2.2.2, “Configuring the kdump type”. For information on how to do so in the graphical user interface, see Section 7.2.3.2, “Configuring the kdump type”. To reduce the size of the dump file, kdump uses the makedumpfile core collector to compress the data and optionally leave out irrelevant information. The table below contains a complete list of filtering levels that are currently supported by the makedumpfile utility. For instructions on how to configure the core collector on the command line, see Section 7.2.2.3, “Configuring the core collector”. For information on how to do so in the graphical user interface, see Section 7.2.3.3, “Configuring the core collector”. The makedumpfile command supports removal of transparent huge pages and hugetlbfs pages on Red Hat Enterprise Linux 7.3 and later. Consider both these types of hugepages User Pages and remove them using the -8 level. By default, when kdump fails to create a core dump, the operating system reboots. You can, however, configure kdump to perform a different operation in case it fails to save the core dump to the primary target. The table below lists all default actions that are currently supported by kdump. For detailed information on how to set up the default action on the command line, see Section 7.2.2.4, “Configuring the default action”. For information on how to do so in the graphical user interface, see Section 7.2.3.4, “Configuring the default action”. When planning and building your kdump environment it is necessary to know how much space is required for the dump file before one is produced. The makedumpfile command can help with this. The --mem-usage option provides a useful report about excludable pages, that can be used to determine which dump level you want to assign. Run this command when the system is under representative load, otherwise makedumpfile returns a smaller value than is expected in your production environment. The makedumpfile command reports in pages. This means that you must calculate the size of memory in use against the kernel page size, which in the Red Hat Enterprise Linux kernel, is 4 kilobytes for AMD64 and Intel 64 architectures, and 64 kilobytes for IBM POWER architecture. The Portal Labs are small web applications that can help system administrators perform several system tasks. There are currently two labs focused on Kdump. The Kdump Helper and the Kernel Oops Analyzer. The Kdump Helper is a series of questions and actions that assist in preparing the configuration files for kdump. The Lab’s workflow includes steps for both clustered and standalone environments. The Kernel Oops Analyzer is a tool to process Oops messages and search for known solutions without having to unwind the crash dump stack. The Kernel Oops Analyzer uses information from makedumpfile to compare the oops message from a crashed machine with known issues in the knowledge base. This can enable System Administrators to rule out known issues quickly after an unexpected outage, and before opening a support ticket for a further analysis.